The Blackhide Wrastler model has been spoiled in No Quarter 32, which I was fortunate enough to pick up at PAX. 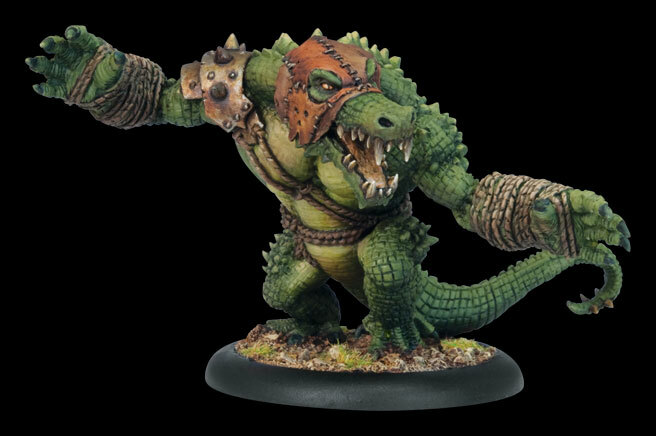 Some clever lads on the forums have figured out a way to use the Wrastler’s animus to send Molik “Already Awesome Without Flight” Karn all the way across the board on turn one by throwing him and then using the Wrastler to stand him up. In another thoughtful post, some questions are raised about a perceived creep towards Mk 1 shenanigans with overpowered set combos resulting in early-game victories, especially since this exact combo is a return to some similar throwing combos from before the reboot. It's all fake, you know. At the heart of the issue with the Wrastler is that the animus allows a Friendly model to stand up with no penalty for 2 Fury. Since Wrongeye and Snapjaw can be taken with six factions, and Wrongeye can also include the Wrastler with Snapjaw, this means you can have large flying models–like Molik Karn–which can then go on to activate later in the turn and use various pointy things to raise grievances with your opponent. Similarly, there appear to be complaints regarding the Fennblades UA (about whom I know nothing) and the Satyxis Blood Raiders UA (whom I have seen being very naughty on Vassal), as well as perceived rules bloat with models like Janissa Stonetide, the back of whose card admittedly does look like 19th-century Russian Literature in length due to the number of unique rules. I do feel that the Wrastler animus could be brought in line by making it Friendly Faction, though of course as an inexperienced player I was surprised by the Wrongeye bit, here, and may be missing all sorts of broken. I think the Lessers could get specified as only allowed to be associated with their named companion–or at least I can’t think of any real reason not to do that since they always have a named companion with them; they aren’t supposed to be the same as a Jack Marshall, as far as I can tell. I am sure there are other approaches to resolving this specific issue (and I can’t imagine this is intentional). Breaking intended play with new flavors is risky in the short-term, rules stagnation is risky in the long-term. PP have put out an absurd amount of content in a year. Kudos to them for it. Ambition often results in progress fulfilled at the cost of details, which is in part why organizations get more conservative and less nimble as they grow, due to institutional memory of past mistakes. And sometimes a designer’s vision is different from mine or yours or his or hers. I hope Privateer resist the drag towards the middle of the envelope. As far as many combos perceived as broken, my suspicion is that someone will find a way to make people pay for what their opponents choose to do on the field. That’s not a shout out to Page 5, that’s just tactics dating from the first time someone used a pointed stick to make an opponent pay for throwing a rock and suddenly finding himself weaponless. What are the answers to the Wrastler tactic? To the Fennblades? To the Satyxis Raiders? I feel like there are going to be many opportunities to make someone regret overextending themselves. All of the Lesser Warlocks are permanently associated with their companion warbeasts, although their rules allow for taking additional beasts. EG, I can field War Hogs with Rorsh and Brine, but I have to pay the full cost for R&B (9 points) plus the full War Hog (8 points) and they are limited by Rorsh’s damn low fury stat (3). Sure, I just mean restrict them to their associated companions alone, to avoid exposing the faction-limited beasts to other factions. The low fury stat limits their generalized effectiveness, but in situations like the Wrastler, where there is a set strategy and the cost of Wrongeye and Snapjaw is spent as a missile delivery system, then it inherently limits their ability to make unique mecanics for the Gators alone, since Wrongeye works for almost everyone. It’s a rather wide-reaching gobsmack, but if you are going to change that, change it now before people get too married to the idea of Wrongeye with multiple beasts. I think the cheese is bound to happen in any competitive gaming environment where so many factors can be combined largely at will and it won’t go away. Warmachine Mk 1 suffered from it at least after the release of Legends and Hordes will go the same way. Mk 2 didn’t change a thing about the cheese and how could it? What bothers me most isn’t even that people go extreme on what to do to win a miniature game, it’s the simple fact that with the ever-increasing model count all the factions in the game become bland and feel quite genuine. Cygnar goes stealthy, Cryx goes tough, Circle goes Heavy Infantry, Skorne goes mobile etc. I decided to go Prime or Primal only for a while and luckily my gaming buddies, being annoyed themselves by the flood of new releases, are with me. Helps to concentrate on the essentials: that Warmachine/Hordes is a simple though clever and enormously fun game system. Getting rid of Unit Attachments, Cavalry, Epic Casters, Character Units etc. is a price i gladly and willingly pay to get my fun back on the tabletop.